It’s doubtful any kind of service business is capable of receiving a near-perfect satisfaction rate, including most veterinary practices—except for those that are certified as Cat Friendly Practices (CFP). In January, the American Association of Feline Practitioners (AAFP) announced the results of its 2017 Cat Friendly Practice Survey, which found a 99 percent satisfaction rate among participating veterinary clinics. The CFP program is a collaboration of feline experts who provide guidelines to ensure a more positive and less stressful veterinary experience for cats and their owners. According to Elizabeth Colleran, DVM, MS, DABVP, AAFP co-chair of CFP, it was a long time coming. 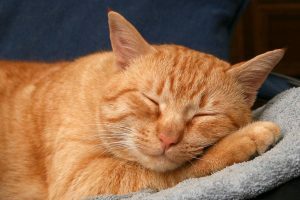 “Using low-stress handling techniques on cats minimizes high stress in the veterinary team. It’s a safer and more effective way to practice,” said Jan Yaroslav, RVT, VTS (dentistry), of Mangrove Veterinary Hospital in Chico, Calif. Most importantly, when cats panic and their cortisol levels skyrocket, the quality of the exam isn’t nearly as good as it might be, and the experience for both cat and client suffers. According to AAFP, CFP survey respondents also noted a 61 percent decrease in injuries when handling cats. Arguably, the most important finding to come out of the survey is that 75 percent of respondents indicated client visits for cats are up. That’s good for business, but I argue it’s even better for felines. One criticism of CFP accreditation is that the process isn’t rigorous enough, but some would argue the survey’s findings speak for themselves. Clearly, CFPs are happy with their choice to be certified. When certified, all team members receive the Journal of Feline Medicine & Surgery. And many CFPs take advantage of their certification (as they should) to tout their participation in the program to attract new clients. Still, only about 2,000 practices are CFP certified, including “shoo-in” feline-only practices, which presumably became certified with little effort. That’s a drop in the catnip teacup, considering there are approximately 25,000 veterinary practices in North America. I’m unsure why Banfield and VCA haven’t made CFP certification a requirement, or at least strongly recommended it across all their clinics. Aside from adhering to cat-friendly best practices, the only real requirement is being a member of the nonprofit AAFP. While many veterinarians are supportive of CFP, veterinary nurses appear convinced of its benefits. Of course, many tools are available now that weren’t around just a few years ago, ranging from feline facial pheromones to pharmacological intervention at the client’s home, even before the cat even goes into the carrier. As a strategy to recruit future veterinarians, Nestlé Purina PetCare is helping support AAFP by communicating the CFP message to veterinary students. While cats remain under-medicalized compared to dogs, I suggest a change is occurring. The majority of today’s pet owners are millennials, whose pets of choice are cats. From cat cafés to cat conventions to cat chat corners online, interest in felines is rising. In fact, according to the American Pet Products Association’s Generational Report – Volume 2, 35 percent of cat caretakers are millennials, the largest demographic segment who share their lives with cats (up from 22 percent in 2014). While 2018 may be the Year of the Dog according to the Chinese New Year, we may be entering the era of the cat. If so, it appears CFP is helping to provide the tools to pounce on this opportunity. Steve Dale is a certified animal behavior consultant who speaks at animal welfare and veterinary conferences. Visit his website at stevedale.tv. Columnists’ opinions do not necessarily reflect those of Veterinary Practice News.